Regardless of the type or size of your business operation, PhillyJunk is eager to handle your commerical junk removal needs. Let us help you turn that disorganized, cluttered space into usable square footage that can add to your bottom line. Our professional, insured, uniformed employees will come directly to your location or locations, as many times as you need us to, and haul away just about anything you want to get rid of – professionally, safely, promptly, efficiently and affordably. No job is too big or too small for PhillyJunk. And if you’re like us and want to do all you can to protect the environment by recycling or donating your usable stuff, we can arrange for that, too. Are you in commercial real estate or a building owner? Does your business have rental properties undergoing renovation? Have you bought foreclosed properties that need a serious cleanup before going back on the market? Are you a retail operation with one or multiple locations? Are you an institution that’s planning an expansion? In any of these cases and more, PhillyJunk has your back. Let us show you how we can help. If you anticipate an ongoing or periodic need for our junk removal services, we can generate mutually beneficial contract agreements that will make you a Preferred Customer. Doing so can ensure PhillyJunk will be at your beck and call whenever or wherever your needs arise. If this option sounds right for you, call PhillyJunk.com at 1-888-810-5865. We’ll pick up almost anything. We’ll remove old office furniture, chairs, filing cabinets, lighting fixtures, computers and servers, office cubicles, discarded materials from former/evicted tenants, conference room table & chairs, and construction debris including brick, concrete, glass, wood, and roofing materials, to name just a few. For a comprehensive listing, click here. 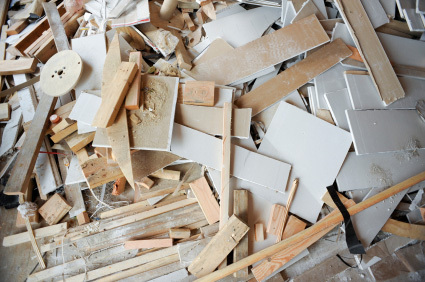 We all know disposal of certain kinds of materials is strictly regulated by federal, state and local laws. Philly Junk is environmentally friendly and concerned for the safety of our employees and customers alike, and so we abide by all applicable laws. For example, we cannot accept any hazardous materials, biological or medical waste, paints, solvents, propane tanks, asbestos, flammable fuels and oils. For a complete list, click here. 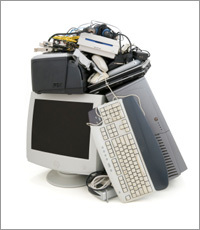 Our core philosophy at PhillyJunk is to recycle or donate wherever and whenever possible. The stuff that is obviously rubbish will be discarded at transfer stations, landfills or scrapyards. But many items — chairs, desks, couches, electronics, office cabinets, partitions, monitors – have some life left in them and can be recycled or donated to charities who can put them to good use. If you agree with us about protecting our planet and being good corporate citizens, just let us know and we’ll direct your usable stuff to the right people. When you book an appointment online, Philly Junk employees will arrive at your location or locations, identify the volume of materials to be removed, determine your interest in our recycling or donation program, and prepare all-inclusive quotes right then and there. When you do business with PhillyJunk, there are never any hidden fees. Pricing is determined by several factors; to learn more, click here. If you approve our quote, removal can begin immediately.